In many modern organizations, the right hand doesn’t always know what the left hand is doing. With each department so fervently focused on its own objectives, we often have a rather limited view of what our coworkers are actually tasked with. As a result, the whole doesn’t always end up being greater than the sum of its parts. But it’s not necessarily a lack of desire on our colleagues’ part. In fact, most people want to be engaged with their work in a more meaningful way. Unfortunately, only 31.5% of US employees say they feel connected with their company’s mission. An employee advocacy program can help. By curating content through a central platform and inviting your colleagues to share interesting and relevant information across their social networks, you can help connect the dots within your organization. Such efforts will not only amplify your brand’s reach and engagement, but they will also impact individuals in a measurable way. In fact, according to the Gallup Organization, engaged employees are 22% more productive while also being more punctual, more present, and more likely to stick around with their company. In spite of this promising data, many brands aren’t set up for success. They either aren’t thinking through social media as a critical factor for their business, or, if they do have a formal employee advocacy program in place, they are executing it in a way that just isn’t sustainable or as effective as it could be. 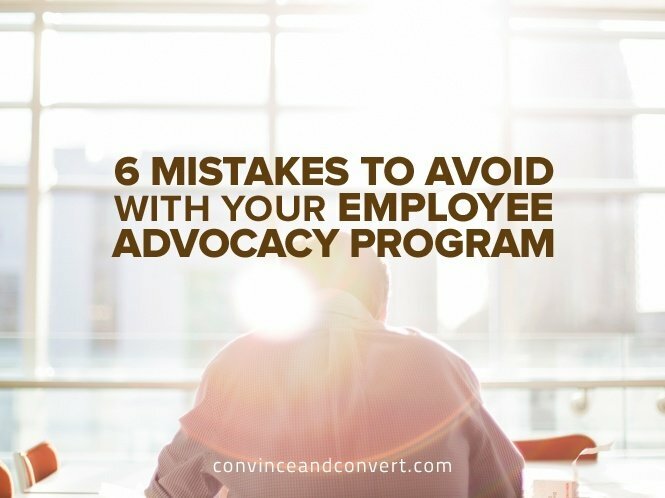 With that in mind, here are six common missteps to avoid when running an employee advocacy program—and how to solve these challenges to improve engagement at every level. Some organizations attempt to gamify their advocacy programs to drum up employee participation. While this can provide a measure of success, putting incentives at the forefront of your efforts is not recommended. Proceed with caution. Too much focus on gamification conditions your employees to regularly expect some sort of incentive. Over-gamification puts a carrot in front of every intended action, from sharing content to reading important company news. Can you really sustain rewarding employees for every action? If incentivisation gets curtailed because of financial constraints or other unforeseen circumstances, you will be left with the rug pulled out from beneath your feet. Solution: To motivate your employees in a more sustainable and scalable way, you should provide frequent, targeted, and easy-to-consume information that makes each team member feel essential to the overall organization. That means directly drawing the line between what’s being shared and why it’s important to different departments, with specific individuals given a shout-out for contributing to some larger effort. Incentives can support these efforts but shouldn’t be the focus. Check out these 21 recognition ideas for what might be a better bet. Employees are constantly inundated with emails, texts, calls, articles, social posts and much more throughout the day. With that in mind, know that you are competing for a lot of attention within a crowded space. In fact, most workers spend one-fourth of the workday just reading and responding to email alone. Amid all that noise, understand that it can be difficult for your employees to discern what company news they should be paying attention to, and why. It’s up to your curation team to make the case by providing context and targeting messages to the right people. A lot of organizations overlook this altogether, assuming all their content is relevant to all parties at all times. This fatal flaw curbs consumption by giving people too much information to sift through. Solution: Curate the most important content to different segments within your organization, stating clearly why it’s relevant to each. At the same time, know what constitutes the big news that everyone needs to know, which will probably be an easy sell to get people sharing across their social networks. All too often, companies will curate an article for their employees to share and then queue up a Tweet, Facebook post, or LinkedIn update—but in locked mode so that employees can’t add their own thoughts or tweak the language to be more in their own voice. This defeats the purpose of employee advocacy. The intent is to empower your people to share important information while positioning themselves as trusted experts in their fields. Locking messaging undermines this effort by making your employees seem like nothing more than cogs in the mass marketing machine. Solution: While compliance issues and legal concerns are valid, it’s best to provide suggested messages that employees can personalize when possible. To ensure that the messages going out across your employees’ networks are always on brand, provide training and guidelines with some basic do’s and don’ts around your brand’s voice and tone. When brands are overly concerned about controlling conversations, they often limit what their employees can discuss publicly all together. This approach needs to be re-imagined for the modern era, as social becomes more integral to our communications (both personal and professional). It can’t be stated enough: One of the most important aspects of an advocacy program is supporting the personal brands of your employees. (highlight to tweet) If you understand and communicate that basic principle, your employees will feel more engaged, knowing your company cares about their professional development instead of just turning a profit. Unfortunately, the individual brand-building component of an employee advocacy program is often an afterthought. Solution: Support your employee’s professional ambitions by giving them direction on ways to build their career through training, mentoring, and support from leadership. Also, ensure you have the right policies in place to guide your people about how they should approach different social networks with specific tactics. And remember to curate content that highlights your employees’ success—from speaking engagements to mentions in the news. “If you build it, they will come,” rarely applies in business. This is particularly true with employee advocacy. Most organizations do a good job of promoting their advocacy program when it launches but then fail to keep selling it internally. Remember: The attention of your employees is split among different tasks, making it easy to ignore a program that doesn’t seem to be a priority for leadership. Solution: Set benchmarks for overall adoption of your program as well as individual shares. Pursue these goals with fervor by reminding people to log in to the platform to share fresh content. This can be supported through automated emails, special broadcasts, and integration with other messaging tools, as well as through internal ad campaigns showing how different people benefit from the program. Encourage each department to stress the program’s importance, ensuring that your employees understand the value of the information being curated. Promoting your employee advocacy program will only get you so far if you don’t have some serious data to back up your efforts. This is another gray area for many organizations—they just aren’t sure exactly what to measure. Solution: Bambu by Sprout Social provides a comprehensive tool for both executing and measuring your employee advocacy program. Bambu’s robust analytics system in particular will help you understand if you have served up the right content, driven more engagement, and increased your brand’s overall reach. When all’s said and done, perhaps the most important measure of an effective employee advocacy program is knowing that you have helped connect the dots for all the people within your organization. The corollary will be a greater impact for your brand. Take a more thoughtful and strategic approach to this process, and your business will be well on its way to achieving even greater success—which everyone can share together. Want to build or perfect your own employee advocacy program? Download this free guide by Jay Baer and Sprout Social.